Yi Se-tol secured Korea its eighth victory in ten years in the Nong Shim Spicy Noodles Cup. In the final round, held in Shanghai, Chang Hao of China eliminated the last surviving Japanese representative, but then Yi polished off the top two players in the Chinese team. On this occasion, the services of Korea's 'iron goalkeeper', the team captain Yi Ch'ang-ho, were not required. China and Japan have each won this tournament just once. Game 11 (17 Feb.). Chang Hao 9-dan (China) (B) defeated Takao Shinji 9-dan (Japan) by resig. Game 12 (18 Feb). Yi Se-tol 9-dan (Korea) (B) defeated Chang by resig. Game 13 (19 Feb). Yi (W) defeated Gu Li 9-dan (China) by 3 1/2. The best-of-five final of the 6th Ing Cup, the richest international tournament, with a first prize of $400,000, is being contested by two Korean players. After the first three games, which were held in Singapore, Ch'oe Ch'eol-han 9-dan held a 2-1 lead over Yi Ch'ang-ho 9-dan. Game 1 (3 March). Yi (W) by 3 points. Game 2 (5 March). Ch'oe (B) by 6 points. Game 3 (7 March). Ch'oe (W) by resig. Yet another international tournament has been founded by a Korean corporation. This month the BC Card Cup World Baduk Championship made its debut. This tournament has a handsome first prize of 300 million won (though, at nearly $194,000, worth only two thirds in dollars what it would have been before the recent disastrous drop in the Korean won). Second prize is 50 million won. The BC Card Cup has a complicated system of preliminaries conducted on the Net and also has some places for amateurs. The time allowance is three hours per player plus 30-second byo-yomi three times. Sixty-four players, divided up into four blocks, started off in the main tournament, the opening round of which was held in early March (staggered over a couple of days). Up until this point, no game fees are paid, which is unusual for an international tournament. Fees kick in for the players who make the best 32. We don't know if any Japanese players took part in the preliminaries; if so, they were unsuccessful, as only two, the national seeds allotted to Japan, took part in the first round. Cho Chikun (W) lost to Pak Hong-seok 6-dan of Korea by 5.5 points and Iyama Yuta (W) defeated Kim Seung-chae 2-dan, also of Korea, by resignation. The above two games were played in the round of 64, which could be considered as Round 1. Round 2 is being played on various dates between 12 and 22 March, a very unusual arrangement for an international tournament. The tournament will culminate in a best-of-five in May. Iyama (B) beat On So-chin 4-dan of Korea by resignation. Pak Yeong-hun 9-dan (B) beat Pak 1-dan by resignation. Han Ung-kyu 1-dan (Korea) (B) beat (Ms) Cho Hye-yeon 8-dan (Korea) by resignation. Cho Han-seung 9-dan (Korea) (B) d. An Hyeong-chun 1-dan (Korea) by resignation. Huang Yizhong 7-dan (China) (B) beat Ch'oe Ch'eol-han 9-dan (Korea) by resignation. Kang Tong-yun 9-dan (Korea) (W) beat Li Tang 6-dan (China) by half a point. Cho Hun-hyeon 9-dan (Korea) (W) beat Zhou Junxun 9-dan (Taiwan) by half a point. Yi Se-tol 9-dan (Korea) (B) beat Chen Siyuan 7-dan (Taiwan) by resignation. China needed to play only one game in the third round of the 7th Cheongkwanjang Cup, a team tournament for women players from China, Korea, and Japan. Thanks to Song Ronghui 1-dan, who won the first six games, then Li He, another 1-dan, who wrapped up the second round with two straight wins after a two-game interruption by Korea's Pak Chi-eun 9-dan, China had an overwhelming advantage going into the final round. In the 11th game, played on 9 March, Li He extended her winning streak to three by defeating Yi Min-chin 5-dan of Korea (in our previous report, we mistakenly gave her surname as Li - actually the Korean Yi and the Chinese Li are written with the same character). Taking white, Li won by resignation. This one-sided triumph (Korea won two games, Japan none) shows that Chinese women's go has reached a very high level. Chinese female 1-dans may usurp the fearsome reputation previously enjoyed by Korean male 1-dans. Yoda Norimoto's challenge for the 33rd Kisei title quickly got into trouble when he lost the first two games, with an upset half-point loss in the second game being particularly painful, but he fought back to take the third game by the same margin. He followed that effort with another win in the fourth game, so he had evened the score. In effect, the match was then a best-of-three. However, Yamashita bounced back with a win in the fifth game, so the momentum of the series has changed again. The next game became a kadoban for Yoda and he failed to survive it. The third game of the best-of-seven was played at the hotel Nautique Shiroyama on the island of In-no-shima, the birthplace of Honinbo Shusaku, in Hiroshima Prefecture on 4 and 5 February. The game finished at 7:09 p.m. on the second day, with Yoda, playing white, winning by half a point after 254 moves. Fittingly for a game played not far away from the house where Shusaku was born, Yamashita started with the Shusaku fuseki with his first three moves. Yoda went along by following the traditional pattern, so the stage was set for Yamashita to play Shusaku's trademark diagonal move with Black 7. He thought about it, but felt that the burden of the komi was too big. Early in the game, Yoda provisionally discarded some heavy stones, but came back later and secured a brilliant sabaki for them. This gave him a lead that became more definite as the middle game progressed. However, he subsequently slipped up in defending a corner group from attack and let Yamashita make the game close. In the end, he just managed to cling to a narrow lead. The fourth game was played at the Kashoen, one of the most luxurious Japanese-style inns in Yamanashi Prefecture, on 19 and 20 February. The inn is located in the city of Hanamaki. The game looked like becoming a drawn-out contest, but Yoda took advantage of a slack move by Yamashita in the middle game to start a confused fight and seize the initiative. Yoda kept his cool and wrapped up a win after 213 moves. The fifth game became crucial for deciding who would take the initiative in the series. From Yamashita's point of view, suffering three losses in a row would give his opponent all the momentum, so there must have been a lot of pressure on him, but undoubtedly Yoda was no more eager to face a kadoban in the next game. In this case, however, Yoda had no choice but to pull out his group even though it was exposed to harassment by Black. From this point on, Yamashita held the initiative. Yoda's problems were compounded when he let himself get into a ko fight that he couldn't win. This miscalculation made him fall decisively behind in territory (that is, by professional standards). Yoda later launched a do-or-die challenge, but was not able to upset Yamashita's lead. The latter won by 5.5 points. This was a good win for Yamashita. According to Hane Yasumasa and his son, Hane Naoki Honinbo, Black was not behind at any point of the game, so he would have been full of confidence for the sixth game. For his part, Yoda was able to console himself that he had on the whole played positively, so he wasn't dispirited. The sixth game was played at the Atami Korakuen Hotel in Atami City, Shizuoka Prefecture on 11 and 12 March. The game finished at 7:34 p.m. on the second day, with Yamashita, taking white, winning by 2.5 points. Playing white, Yamashita set up a moyo and launched severe attacks on Black when he invaded. Yoda played with his inimitable flexibility, twice sacrificing stones when they became heavy. He managed to make deep inroads into the moyo, but couldn't quite reduce it enough. The issue was decided in a very tense endgame. The game was typical of the series, in that Yamashita owed his victory to his unrelenting attacking strategy. The 30-year-old Yamashita has now won the Kisei title four years in a row. One more win and he will qualify for the title of Honorary Kisei (assumed when you turn 60; if you win ten in a row, you assume the honorary title as soon as you lose the real one). Yamashita also took revenge for his failed challenge to Yoda Meijin in 2003, when he lost 1-4. Game 1 (14, 15 Jan.). Yamashita (B) by 1.5 points. Game 2 (28, 29 Jan). Yamashita (W) by half a point. Game 3 (4, 5 Feb.). Yoda (W) by half a point. Game 4 (19, 20 Feb.). Yoda (B) by resignation. Game 5 (25, 26 Feb.). Yamashita (B) by 5.5 points. Game 6 (11, 12 March). Yamashita (W) by 2.5 points. The 47th Judan title match features one of the top pairings in contemporary Japanese go: Takao Shinji, the titleholder, vs. Cho U Meijin, the challenger. The first game was held in Tokyo, at the Hotel Metropolitan Edmont in Iidabashi, not far from the Nihon Ki-in, on 5 March. After a marathon struggle lasting 352 moves, Takao (black) won by 2.5 points. In the middle game, Cho had seemed to have the lead, but Takao played a brilliancy that no one else - his opponent or the players following the game - had seen and so pulled off an upset. This was Takao's 700th win in his professional career. He set some records, having the best winning percentage, 72.5%, at this point, and also being the fastest (17 years 1 month) and youngest (32 years 4 months) to reach this benchmark. The second game will be played on 18 March. The final of the Ricoh Cup Professional Pair Go Championship 2009 was held on 31 January. Playing white, Kato Keiko and Hane Naoki beat Xie Yimin and Iyama Yuta by half a point. First prize is five million yen, of which one million is donated to buy go equipment for schools throughout Japan. Umezawa Yukari, the defending champion, made a good start by winning the first game in the 12th Women's Kisei title match, as previously reported. However, the challenger, Kato Keiko 6-dan, holder of the Strongest Woman Player title, evened the score by winning the second game by 2.5 points with black, the same margin as in the opening game. Umezawa had taken the early lead, but had gradually slipped behind in the latter part of the game. It was played on 28 January and televised on 18 February. In the deciding game, televised on 25 February, Umezawa, taking white, made a mistake in the opening, but she kept her cool and played steadily, waiting for a chance to get back into the game. Her patience paid off and she was able to stage an upset, getting revenge for her upset loss in the second game. She has now won this title three years in a row. First prize is five million yen. The results: Game 1. Umezawa (B) by 2.5. Game 2. Kato (B) by 2.5. Game 3. Umezawa (W) by resignation. The first game of the 21st Women's Kisei title match was played at the Hotel Metropolitan Edmont in Tokyo on 4 March, the day before the first Judan game was played at the same hotel. The challenger, Chinen Kaori 4-dan, played her typical attacking game, but she was skilfully parried by the titleholder, Xie Yimin. Xie then turned to attack and secured a resignation after 230 moves. Xie had white. The second game will be played on 17 March. In the final of the 28th NEC Cup, played on 7 March, Hane Naoki Honinbo defeated Cho U Meijin to win this tournament for the first time. Taking black, Hane won by resignation. First prize in the NEC Cup is 17 million yen, which outranks four of the top seven titles. With eight of the nine members having completed three rounds, Iyama Yuta 8-dan was the only undefeated player in the 34th Meijin League. He was helped when Sakai Hideyuki 7-dan beat the only other undefeated player, Ogata Masaki 9-dan, on 5 March. Ogata and Sakai are among the four players with just one loss. On 9 March, the first game in the fourth round was held. Iyama defeated Takao Shinji, so his chances of repeating as Meijin challenger continued to improve. Incidentally, this was Iyama's tenth win in a row in a winning streak that started on 25 December. Yamada Kimio picked up a win in another fourth-round game, played on the 12th, so he remains in the best position if Iyama falters. Iyama Yuta 8-dan (W) beat Cho Riyu 7-dan by resig. 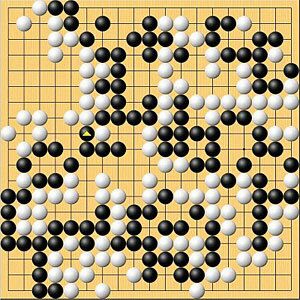 (19 February) Sakai Hideyuki 7-dan (B) beat Cho Chikun, 25th Honinbo, by half a point. (26 February) Yamada Kimio 9-dan (W) beat Takao Shinji Judan by resignation. 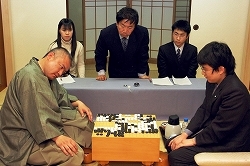 (5 March) Sakai Hideyuki 7-dan (B) beat Ogata Masaki by resignation. (9 March) Iyama Yuta 8-dan (B) beat Takao Shinji Judan by resignation. (12 March) Yamada Kimio 9-dan (B) beat O Meien 9-dan by half a point. Takao Shinji and Yamada Kimio both won their games in the fifth round of the 64th Honinbo League, so they continued to lead the race to become challenger. However, Yamada suffered a big setback in the sixth round, when he lost to Yamashita Keigo. That puts Takao in a very favourable position, as he is now two points clear of the field. He will become the challenger to Hane Naoki if he wins his sixth-round game against Kataoka Satoshi. In the worst case, if he loses both that game and his final-round game against Yamada Kimio, he will still qualify for a play-off with Yamada. Only the top two players qualify for a play-off, so Yamashita is already out of the running, although he could end on the same score as Takao and Yamada. (5 February) Takao Shinji Judan (B) beat Nakaonoda Tomomi 9-dan by resig. Yamada Kimio 9-dan (W) beat Cho U Meijin by resig. So Yokoku 8-dan (W) beat Kataoka Satoshi 9-dan by resig. (12 February) Yoda Norimoto 9-dan (B) beat Yamashita Keigo Kisei by resig. (5 March) Yamashita Keigo Kisei (B) beat Yamada Kimio 9-dan by resignation. So Yokoku 8-dan (B) beat Nakaonoda Tomomi 9-dan by resig. The first of the nonseeded Japanese seats in the 22nd Fujitsu Cup was won by Kono Rin 9-dan, though not without a bit of luck. In the final round of the qualifying tournament, his opponent, Rin Shien 7-dan, played very well in the middle game and took an overwhelming lead. However, Kono played patiently and staged an upset in the endgame, winning by 1.5 points with black. Rin's lamentations after the game were prolonged and bitter. The second play-off featured a regrettable pairing from the point of view of Japanese fans: it was Yoda Norimoto vs. Iyama Yuta. Yoda is one of the most dependable Japanese representatives in international competition, so fans would like to see him represent his country in every international tournament, but you need to hold a top title to get a seeded place or to win quite a few games in succession to get a nonseeded place. The conflict is that Japanese fans would also like to see Iyama get as much international exposure as possible. The play-off between the two was held on 9 February and was won by Iyama. Three days later, the other remaining play-offs were held. Moriyama Naoki of the Kansai Ki-in defeated O Rissei and Takao Shinji beat Yamada Kimio. The opening rounds of the 22nd Cup will be held on 11 and 13 April. (9 February) Iyama Yuta 8-dan (W) beat Yoda Norimoto 9-dan by resig. (12 February) Moriyama Naoki 9-dan (W) beat O Rissei 9-dan by 2.5 points. Akiyama Jiro 8-dan (W) beat Yuki Satoshi 9-dan (Kansai Ki-in) by resig. (19 February). Kiyonari Tetsuya 9-dan (B) of the Kansai Ki-in beat 24th Honinbo Shuho (Ishida Yoshio) by resig. (5 March). Ri Ishu 5-dan (B) beat Kataoka Satoshi 9-dan by 1.5 points (12 March). Miyazawa Goro 9-dan (W) beat Takanashi Seiken 8-dan by 3.5 points (12 March). The Yugen Cup Top Stars League is an unofficial tournament organized to give young players experience. Fifty professionals and inseis played in a 12-round league. Mainly they are young players, but quite a few senior players also take part in this project to raise the level of the younger players. In the 2nd cup, they included Kobayashi Koichi, O Rissei, Kobayashi Satoru, Yamada Kimio, Ryu Shikun, and a number of others. The 1st Cup was won by Ko Iso 7-dan. On 12 March, Ri Ishu secured a further promotion, from 5-dan to 7-dan, thanks to winning a place in the Kisei Leagues. He has moved up three ranks in a month. His next targets should be 8-dan through becoming the Kisei challenger and 9-dan through winning the title. (19 February) Redmond (W) beat Seki Kazuya 5-dan by 7.5 points (Preliminary C, 35th Tengen tournament). (5 March) Uchida Shuhei 3-dan (B) beat Redmond by resig. (Preliminary A, 65th Honinbo tournament). (12 March). Redmond beat Inoue Hatsue 2-dan by forfeit.